Need more information about booking Home 7401868 ? 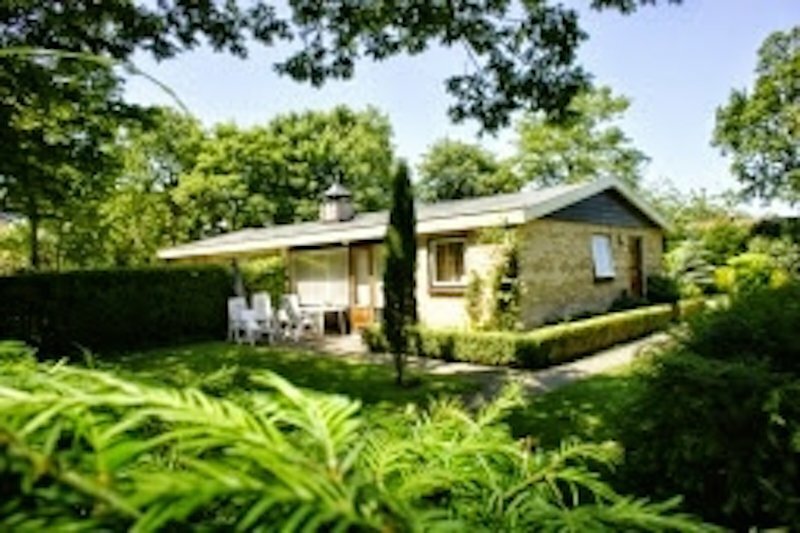 At Domburg: 6 P. No smoking Fantastic holiday house / bungalow located on a quiet, green, public path (30KM area), just behind the dune path (Duinweg) in family bath Oostkapelle. This path ends (600 meters, 10 minutes to the foot) at the beaches, dunes and forests. Opposite this path you walk through the dunes and forests (or along the beaches) to the cozy center of Domburg. On Sunday it is also wonderful to stroll! The house: Free Wifi, central heating, cable TV (ARD, ZDF, WDR, ARTE), tuner, CD, DVD. Mediterranean, spacious, sunny living room, 3 2P. Bedroom, fitted kitchen, bathroom, hall, toilet. Very large, green, private, sunny, fenced garden with 2 beautiful, furnished sun terrace, a garden house with a trolley, BBQ. Your own parking on the entrance in own garden until the 2 car's. Please, take with you your sheets and towels. Behind our house you will find Chaletpark Denennenbos: Since (Apr-Oct) you use the supermarket (every morning warm rolls and your German newspaper), bike rental, outdoor pool, children's playground, snack bar and restaurant. Around the corner on Dünenweg you will find several nice restaurants. We have the most beautiful, clean, sunny, child-friendly, wide, quiet beaches in the Netherlands. (Also a specially dog beach and nudist beach.) You walk for hours along the beaches. On the beach you will find: rental of sun beds / chairs, sun / wind screens, etc; Children's playground, public shower and toilet, beach watch, first aid. You have many paths in the fabulous nature for hiking and cycling. Around the corner at our bungalow you will find Manege Duno; With your horse you can ride along the beach. End of Nov. - end of March we rent per day, at least 3 nights. End of Mar. - End of Nov. we rent per week, ONLY SA-SA You pay Tripadvisor the rent and after your booking we, the owners, will email you about the final cleaning, the deposit and the key. The additional costs we charge with the security deposit, Euro 7 p.Tg your dog Euro 5 p.Tg. (max 2) Tourist tax Euro 1.25 pppn Final cleaning Euro 60, - Zeeland: The peninsulas Schouwen-Duiveland, Tholen, North and South Beveland, Walcheren and Zeeuws-Vlaanderen make up the Zeeland coast. From Renesse in the north to Domburg, Oost- and Westkapelle to Cadzand in the south, the varied range of Zeeland bathing resorts extends. The "island" Schouwen-Duiveland is surrounded by the North Sea, the Oosterschelde and the Grevelingen Sea. Zeeland bridge and storm surge barrier are the connections to the other Zeeland islands. The Grevelingen Sea offers excellent opportunities for swimming, diving, sailing, surfing, waterskiing and much more. Boaters get over the lock Bruinisse to the North Sea. Certainly worth visiting are the old dreamy towns Zierikzee, Burg-Haamstede, Brouwershaven, Renesse, Scharendijke and the ring village Dreischor. Resort Renesse is especially popular with young travelers. There is always something going on in the many bars and discos. Domburg (Walcheren) is one of the most addictive North Sea resorts in the Netherlands. The wide beach is very much loved by families with children. Nearby is Oostkapelle. September is considered a cultural month in Zeeland - the late summer festival offers a varied cultural program for a month. Typical Zeeland: the shell day in Yerseke, with which the shell season is rung in September - free sample of the new harvest and Fleet show included. Here you can visit the modern marinas or nature islands for a picnic in the green. The Westerschelde, the last open connection to the sea, is a real challenge for experienced sailors. Surfers will find their fun especially on the Veersen Sea and the Grevelingenmeer. Also you can even go water skiing here. For diving, the lakes are also very suitable. The Grevelingenmeer is Europe's largest saltwater lake. In the Oosterschelde the salt water of the North Sea is mixed with the fresh water. Many listed buildings in the historic towns and villages bear witness to the rich trade and fishing past. The picturesque town of Veere has an impressive town hall, an interesting harbor and cute little houses - a place for romantics. In the harbor town Vlissingen you can see a lot of the old history of Zeeland. At the Westerschelde there is a long promenade with a view of ships on the way to Antwerp. Middelburg is the capital of Zeeland. You come to our house with your car. In our garden house you will find 2 simple bicycles and 1 handcart. You do not need a car or bike, you can walk to the beaches, supermarket, some restaurants, take-away. If you book our bungalow, we will email you when you have paid the rental rates, more info and how to get the key. Please, smoke on the terrace. You can get in touch with Familie H. (the owner) through the contact form on this page. Send Familie H. (the owner) an email through the contact form on this page. Alternatively, if there’s a phone number on this page, you can call them. How do I contact Familie H. (the owner)? If you’ve already booked, go to Manage your holiday booking to view Familie H. the owner's contact details or send them a message. Or send Familie H. (the owner) an enquiry through the Contact the owner/manager form if you’d like a quote or more info first. When you pay online through the Book your stay form, a booking request is sent to Familie H. (the owner). You’ll find out within 24 hours whether they’ve accepted - no money will leave your account before then. You can also request a quote from Familie H. (the owner) through the contact form. The owner will email you the total cost for your dates and a link to book and pay online. Use the Book your stay form to pay provisionally online. You can pay by credit/debit card or PayPal. Familie H. (the owner) will have 24 hours to accept the booking and no money will leave your account before then. Why can't I call Familie H. (the owner) before booking? You’ll need to contact Familie H. (the owner) to do this. Send them a message in Manage your holiday booking or through the contact form on this page. You can request to change the dates or number of people on your booking via the Manage your holiday booking page. To change your holiday dates use the Edit booking button. If you need to change the number of guests staying then send Familie H. (the owner) a message. If Familie H. (the owner) agrees, they’ll send you a revised quote outlining the changes. You can review and accept/decline this from the Manage your holiday booking page. You’ll have 48 hours to take action before the revised quote expires. Estimated price per night based on a weekly stay. Owner fees of £225.00 per stay may apply. Enter your dates to see the total cost.